Collecting footrot bacteria samples for testing. Photo – AT Aerial Services. ON-FARM same-day footrot testing is a step closer after successful testing of a new method on several sheep properties across Victoria. A La Trobe University team of researchers led by Dr. Travis Beddoe has proven that a loop mediated isothermal amplification (LAMP) assay for in-field detection can accurately diagnose footrot bacteria in sheep. The new in-field testing method has been successfully tested in 19 Victorian flocks and offered the potential to cut footrot testing costs and diagnosis times, enabling quicker decisions on treatment and stock movements. Footrot is a bacterial infection in sheep, with virulent infections showing severe lesions in the hoof and resulting in lameness. It is easily spread over the pasture, particularly in spring in Victoria (September–November), posing a biosecurity threat both on the farm between flocks and in the larger industry. Footrot infections have been estimated to cost Australia’s sheep meat and wool industry $45 million annually. However, ovine footrot’s causative bacteria, Dichelobacter nodosus, is genetically diverse and classified into different serogroups. It has a variety of virulence factors, including AprV2, an extracellular protease, which has been shown to be capable of causing severe or “virulent” disease symptoms under the right conditions. Due to this, a LAMP assay for the detection of aprV2-positive D. nodosus (VDN LAMP) was developed and evaluated for field use. Nickala Best during the footrot test research. Photo – AT Aerial Services. 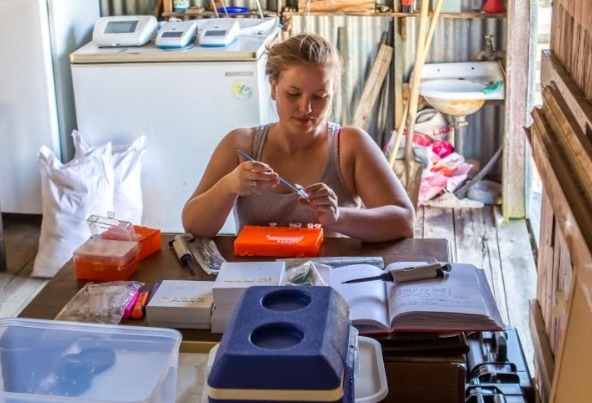 Nickala Best is a PhD candidate from North-east Victoria, now working at La Trobe University on field based diagnostic tests to help control sheep diseases. A peer-reviewed paper in Frontiers in Veterinary Science, co-authored with fellow university researchers Travis Beddoe and Brendan Rodoni and Victorian government veterinarians Grant Rawlin and Robert Suter, reported that the LAMP test can give accurate results within 1.5 hours, while other methods take from one day to up to four weeks. “The VDN LAMP performs best when sampling occurs with moisture present and minimal dirt, with the presence of moisture corresponding to the environment that is ideal for D. nodosus proliferation and expression of virulence factors in Victoria. “Sampling at the end of winter/start of spring, which is the traditional time for footrot spread in Victoria, is recommended for increased sensitivity,” the paper explains. The researchers said rapid identification of aprV2 positive D. nodosus infection in-field may help reduce spread of footrot through earlier detection, encourage more preventative or new management strategies, and provide evidence or confirmation of infection. “It definitely works in the field. The clinical severity of the disease is an interplay between sheep genetics (resistance), bacterial genetics (strain virulence), and environmental conditions. Ms Best said the LAMP reagents are cheaper than current molecular testing, which can cost upwards of $50/sample. A timeline for the availability of the new test is not yet known. The research involved taking samples from 309 sheep in 19 flocks in Victoria to determine the optimum conditions for in-field VDN LAMP assay use and sampling, for detecting aprV2-positive D. nodosus infected sheep. 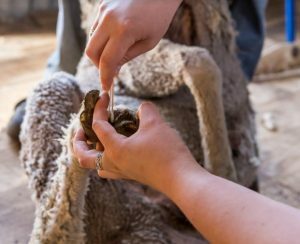 The test was found to perform best when sheep were sampled with moist, clean feet, using a dry swab with the sample prepared in alkaline polyethylene glycol, pH 13.0, as the collection buffer. A sensitivity of 89pc and specificity of 97pc was seen when used in-field under these conditions, when compared to aprV2 detection by rtPCR, with “very good” agreement to rtPCR results. This study shows the VDN LAMP test is easy to use in-field to identify the presence of aprV2-positive D. nodosus in sheep flocks, the researchers concluded.